The first Lifescapes Southeast Asian Film Festival was held from February 3 to 6 at Payap University in Chiang Mai. Here's a couple more of the films I saw. There's a reason the Burmese junta wants the comedian Zarganar in prison – the people like him too much. And in a country that desperately needs someone the people can look up to, Zarganar poses a grave threat. A sharp-witted satirist who can effectively communicate across all media, be it stand-up and sketch comedy, film, television, theater or poetry, Zarganar always made fun of the military government, which got him jailed repeatedly. He's serving a 35-year stretch now for criticizing the junta's lack of disaster relief after 2008's Cyclone Nargis devastated the Irrawaddy Delta. In 2007, British director Rex Bloomstein visited Burma and filmed Zarganar at his home in Rangoon. Scenes juxtapose Zarganar playing his traditional xylophone with footage of Burma's leaders staging military parades. Who's the real threat here? Zarganar, obviously. He's friendly and tells funny jokes. Can't have that in Burma. His talent and charisma pop off the screen, whether it's in TV sketches, directing typhoon relief efforts or just standing there smiling, with a towel on his shoulder to wipe away the sweat of just standing there smiling in Burma's humid climate. Bloomstein kept the footage secret out of deference to the comedian being banned from speaking or writing or even having his name uttered. 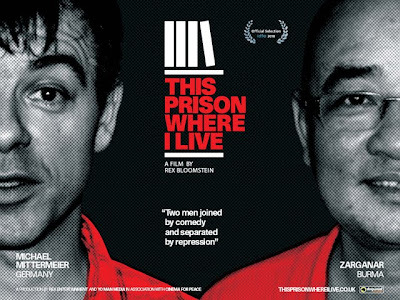 But after Zarganar was imprisoned, Bloomstein became determined to make a documentary. A chance call from German comedian Michael Mittermeier, who was interested in Burmese causes and felt a kinship with Zarganar, made that documentary possible. This Prison Where I Live documents Bloomstein's return to Burma with Mittermeier and their efforts to get as close as they could to the remote prison where Zarganar is being held. The paranoia is palpable. Burmese society is described as a Matrix-like place, where everyone is a potential spy. This Prison Where I Live aims to spark enough interest around the world to raise the call to free Zarganar. The movie played previously at last year's Doi Saket International Film Festival, with Zarganar being honored with a special jury prize. The movie is also playing in Bangkok this week, at the FCCT on Wednesday and at a special screening with Burmese comedians at the Bangkok Art and Culture Center on Thursday. The Nation has more about that in a story today. While news of the American war in Vietnam was broadcast on the nightly news in homes across the US during the 1960s and '70s there was secret sideshow conflict taking place in Laos, a country that remains overshadowed by its bigger neighbors. 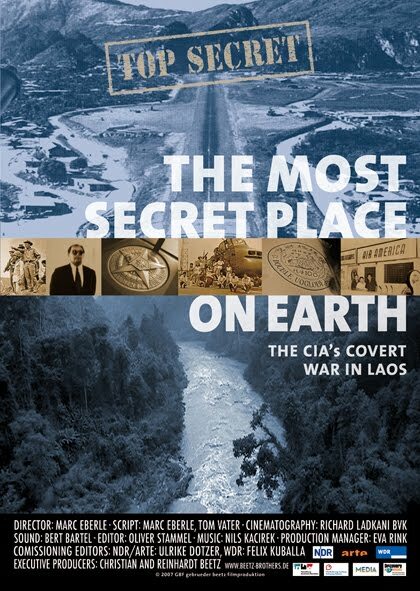 This "secret war" resulted in Laos having more bombs dropped on it than Germany and Japan combined during World War II. The documentary by German director Marc Eberle, co-scripted by http://www.tomvater.com/laos/the-most-secret-place-on-earth-chiang-mai-screening-at-lifescapes-festival-on-february-6th/, interviews various characters who fought that war, among them US diplomat James Lilley, who was a CIA agent back in the day, as well as an Air America pilot and the Hmong general Vang Pao, who talk frankly of their efforts. Critics adding balance to the proceedings are historian Alfred McCoy and journalist Fred Branfman. The idea of the secret war at first was to use the Hmong to fight against the communist Pathet Lao. The CIA supported their efforts by training them. CIA officers like Tony Poe – whose tactics and background are remarkably similar to Lt. Colonel Walter Kurtz in Apocalypse Now – commanded Hmong troops in the field. A secret airbase at Long Cheng, which at one time was the world's busiest airport and Laos' second-largest city, was Air America's base of operations for efforts to supply rice and "hard rice" (a euphemism for weapons and ammunition) to the Hmong freedom fighters. It was a wild time, recalls an Air America pilot, who chuckles as he remembers the girly bars around the airbase and being in awe of charismatic Hmong leader Vang Pao, an illusion that was shattered when he witnessed the general casually shoot a guy. As noble as the ideas were, things got way out of hand, with the war efforts being propped up by the heroin trade, and villages bombed out of existence by the Arc Light strikes by B-52 bombers, aiming to disrupt the Laos leg of the Ho Chi Minh Trail. There are lakes that dot the Plain of Jars to this day. Those are bomb craters. Unexploded ordnance still litters the countryside. The footage of Vang Pao is especially poignant today, because since the film was made Vang Pao has died and been denied burial at Arlington Cemetery. Meanwhile, his Hmong fighters are still in the hills, still fighting. The documentary has footage of photographer Philip Blenkinsop's dramatic discovery of an isolated group of Hmong fighters in 2003.